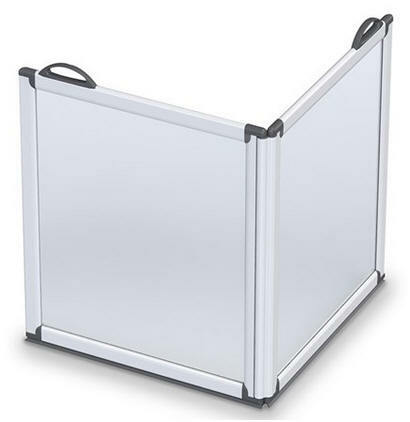 Freestanding, lightweight portable shower screens are ideal when permanent fixtures are either unnecessary, undesirable or impossible. The half height (750mm high) design is ideal for trapping over-spray - especially useful when a carer is needed to assist with showering. But shower screens can prove useful in many different environments, not just for disabled showering. Constructed from powder coated aluminium with anti-shatter semi-opaque panels, these shower screens are extremely durable and easy to transport. Colour contrasting handles to assist the visually impaired. When kept around the home they fold neatly and can be stored easily when not in use. 750mm tall freestanding two panel hinged shower screen. 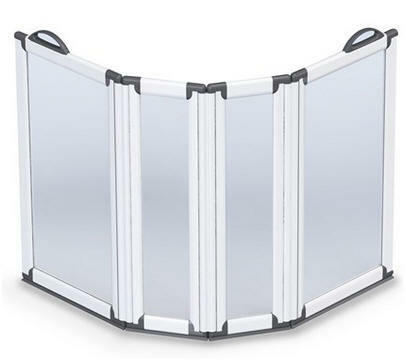 750mm tall freestanding folding portable shower screen with four hinged sections.